Check out what opportunities we have for you this week! We'll be hosting you at the Shaw Davey Slum Diner for a two course meal with a set menu (but let us know if you have any dietary requirements!). Book your place through Eventbrite. We'll see you there! Are you a keen advocate, wanting to collaborate with School staff and enhance the experience of yourself and your peers in the JD? Maybe you should consider joining the staff-student consultative committee! For more information, click this link! Enrol Now! 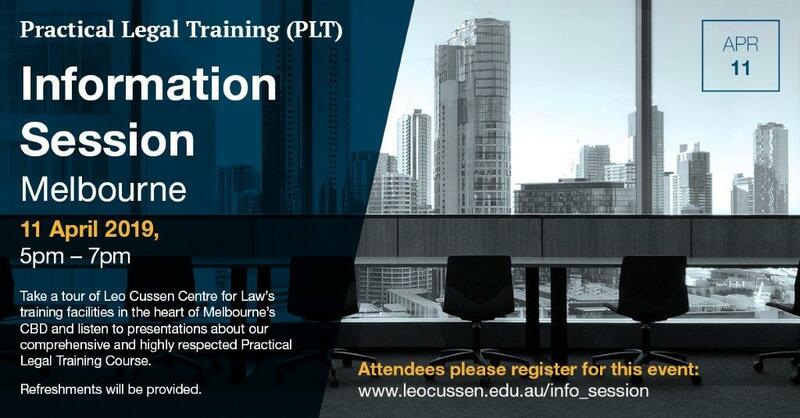 Leo Cussen is still accepting applications for their Melbourne Online PLT Course starting 29 Jan 2019. Secure your place by applying online. You don’t need to wait for your final semester university results. Simply provide Leo Cussen with your most recent unofficial transcript and apply here! Leo Cussen provides you with 13 days of face to face training at the start, middle and end of your course to provide you with a more personalised training and mentoring experience. We are on the hunt for a legal tutor to help improve legal writing with a focus on assignments and strong argument and preferably someone who has done civil procedure. If you're interested or want more information, email president@rmitlss.com. Victorian Legal Aid has announced that they will be launching the program in 2019. There are more details to be released, but in the meantime check out what they've put out here and subscribe to their newsletter if you're interested. The law careers fair, featuring 9 law firms and 3 law schools is on again on the 22nd of March from 10:00 AM to 12:00 PM (followed by lunch and networking up to 2:00 PM) in Seminar Rooms 3, 4 and 5 of the Monash University Law Chambers, Level 2, 555 Lonsdale Street, Melbourne, VIC 3000. For more information and to register, click this link! Are you ready to graduate and looking for a program that is interesting, challenging and full of variety? Check out the ASIC graduate program which is now accepting applications. More information and a flier is available through their website. Stay tuned - Allens Clerkships Program will be opening on 8 July 2019! We'll keep you posted with updates, but in the meantime, it might be worth checking out their Dive In program that offers assistance with navigating the application process for clerkships. The program runs over three afternoons; 23 May, 5 June and 21 June. More information will follow! 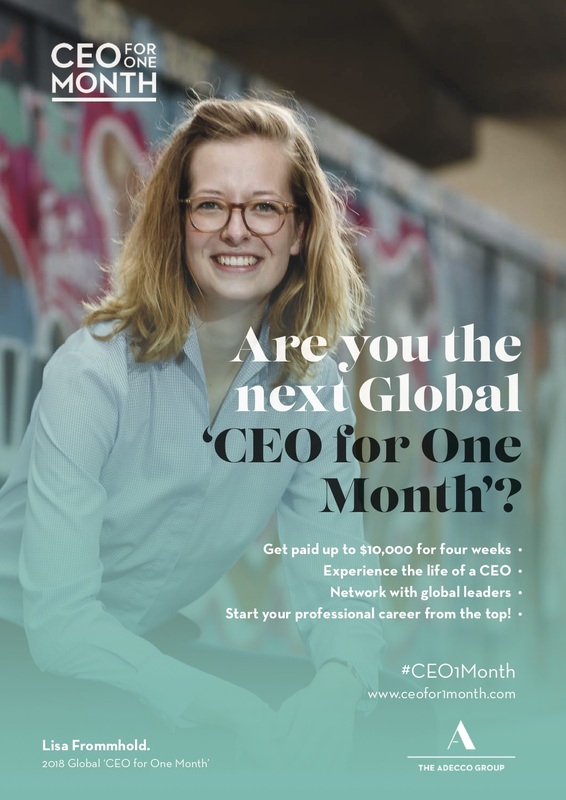 The Adecco Group is the largest HR firm in the world and a Fortune 500 company, and operates with various brand and is offering one student the opportunity to be the CEO for One Month. To see if it is for you, have a look at what Global CEO for One Month of 2018 had to say here. The Juris Doctor Program of the Graduate School of Business and Law here at RMIT is in search of a team of 2-4 students to participate in the coming Commercial Mediation Competition organised by ICC Australia taking place in Melbourne on 26-28 July 2019. The winning team will get the opportunity to compete in Paris in the international part of the competition. The deadline for expression of interest is 9 am Friday 29 March 2019 via email on Christina.platz@rmit.edu.au and you will find all the information you need right here! The Australian Network on Disability runs the Stepping into Program twice a year. Stepping Into is a paid internship program designed specifically for university students with disability to assist them to gain meaningful work experience in the area of their study, to assist them to transition into employment once they complete their degree. To check your eligibility, visit their website. For more information on the current positions available click here. Applications can be submitted here, but you must apply before midnight on 7 April 2019. Don't miss out on any updates, connect to RMIT LSS on our socials! Copyright © 2019 RMIT LSS, All rights reserved. RMIT LSS acknowledges, recognises and respects the Elders, past, present and future of the Wurundjeri people of the Kulin nation who are the traditional custodians of the land on which we meet. RMIT Law Students' Society© COPYRIGHT 2012. ALL RIGHTS RESERVED.